Whose viewpoint is presented throughout the video clip, and why? Define the roles and activities carried out by the Aboriginal men depicted in the video clip in comparison to those roles carried out by the non-Indigenous men. Comment on the positions of authority and power invested in the range of individuals and groups shown in the video. In pairs research and write an informative account on the work and role performed by police officers and government-appointed officials in their capacity of “Protector of Aborigines”. Include details as to when and why the position of Protector of Aborigines began and ended in Australia. Comment on whether the visual images and the soundtrack narration throughout the video clip reinforce or question cultural and racial stereotyping and status, consciously or even unconsciously. Provide examples. If this film were made today, would you expect the viewpoint of the filmmakers to be the same as in the 1950s? Explain. 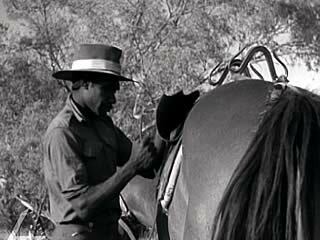 Write a narration either for any section of the video clip, or if desired, the full video clip, from the viewpoint of one of the Indigenous Australians depicted in the film.